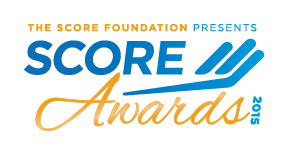 Meet the 2015 SCORE Award Winners! Our winners have demonstrated unique vision, innovation and achievement in support of America's economy and small business community. The SCORE Awards is an annual event that celebrates the outstanding achievements of America's small businesses. Equal parts ceremony, celebration and entertainment, the SCORE Awards is the preeminent distinction in honoring and supporting small business in the U.S.
At this event, we recognize the people and companies that have demonstrated unique vision, innovation and achievement in support of America's economy and small business community. Net revenues from the event help support The SCORE Foundation and its programs, a 501(c)3 non-profit. To select the 2015 SCORE Awards honorees, SCORE asked small business owners and their SCORE mentors to nominate their business by taking a “Business Selfie” and sharing ways small businesses have made the world a better place and how meaningful relationships between SCORE mentors and clients have helped businesses prosper. Below are this year's winners. "Open for Service gives businesses of all sizes an opportunity to change the reputation of an area and offer a safe space for people of all walks of life to visit." Galleries on the Go is an art vendor service that connects local artists with businesses and municipalities to place gallery space in high-traffic areas. Instructural, LLC is an education consulting company that offers an English as a Second Language (ESL) e-learning program to assist adult learners develop their social and business English skills. Flowfold draws on generations of Maine craftsmanship to design and make wallets, totes, and other gear designed with the adventurer in mind. Blind Spot Nutbutters are artisan nut butter spreads sold at specialty food stores and farm markets throughout the Mid-Atlantic, as well as online. MODE offers high-end maternity wear and discounted designer brands. Starseed Bakery, is a wholesale and retail bakery serving products that are gluten free, dairy free, soy free, and free of genetically modified ingredients (GMOs). MarketSmart is a marketing software and services firm that helps nonprofits raise more money more efficiently. MaineWorks specializes in industrial construction placements, and works with people facing barriers to employment like substance abuse recovery and reentry from prison. Incorporate Massage provides onsite corporate and event massage programs in Utah, Idaho, California, and Texas. House Small Business Champion - Chris Van Hollen, Jr.